We’ve all heard Bhutan is beautiful, but is Bhutan worth $250 per day? After three weeks in Bhutan, here are my honest thoughts on whether or not Bhutan is worth your money. $200 to $250 per day, per person. At least. If you can afford it, absolutely. I’ll elaborate on why Bhutan is worth it in a hot second, but first, let’s clear up some misconceptions about the cost of travel to Bhutan. Basically, all foreign, non-regional tourists in Bhutan must pay a minimum daily fee. If you’re traveling solo, add an extra $40 per day. If you’re traveling on a private tour with only two people, you’ll pay another $30 per day, per person. Note: Indians, Bangladeshis, and Maldivians are exempted from this daily charge. There are also some discounts available, primarily for students and children ages 5 – 12. See the Tourism Council’s website for more details. Those looking for more luxurious accommodations in 5-star hotels and resorts should expect to pay several hundred dollars more per day. The same goes for those interested in trekking with high quality gear and camping equipment. What’s included in Bhutan’s tourist fee? Many people assume the fee is something paid on top of other expenses in the country. Not so! Licensed Bhutanese guide from an official Bhutanese tour operator. My guide was incredibly chill, helpful, and a great companion throughout my 3+ weeks in Bhutan. Driver and transportation. Usually means a comfortable and new 4×4, or a medium-sized tour bus. Internal flights are not covered. Accommodation. Hotels are all at least 3-stars, clean, and often spacious with impeccable service. Homestays and camping can also be requested. Trekking gear. If you’re going on a trek, that is. All taxes within the country. 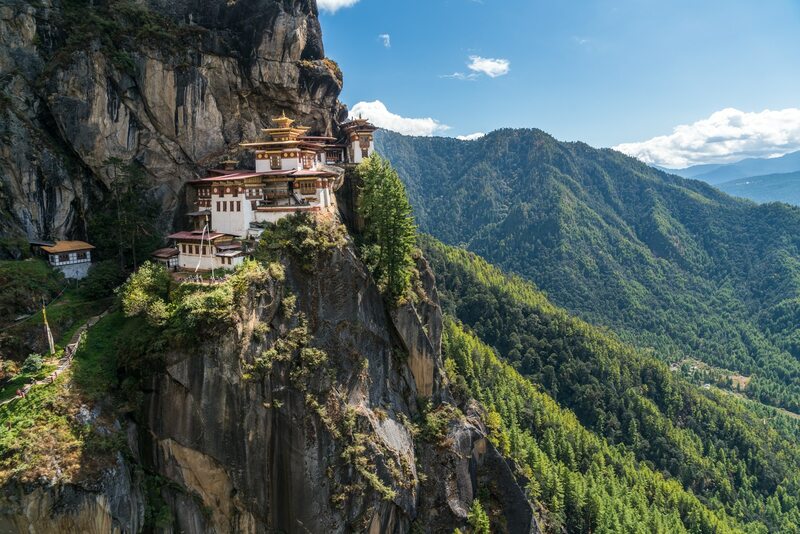 Once you’ve paid your tour company, you could theoretically waltz into Bhutan without cash, no problem… though your guide will deserve a tip by the end of your trip! Obviously a slice of the pie goes to the tour agency, guides, drivers, hotels, etc. What’s more interesting is the $65 per day going to the government’s “sustainable development fee”. Fancy name aside, this means around 30% of your money goes to free health care, free education, poverty relief, and infrastructure for Bhutan’s people. And unlike some of Bhutan’s less scrupulous neighbors, you can rest assured this money is actually being used as intended. Even to the average tourist, the results of this money are visible. I had extended English conversations with 12-year-olds, there’s a slick new highway being built across the country, and I was told stories of Bhutanese people being sent abroad for medical treatment… free of cost! Bhutan is a land-locked country of only 700,000 people, with limited options for export or industry due to its mountainous terrain. Much of the country’s population is poor, and 12% live below the international poverty line. The government is grappling to maintain Bhutan’s well-preserved culture in the face of rapid development and modernization. Tourism is one of very few major industries in Bhutan, but unbridled tourism can quickly consume a country and its culture… especially when the country is home to less than one million people. Bhutan doesn’t want to become the next Venice sinking under the weight of millions of holiday goers, nor attract the hordes of culturally insensitive backpackers who flood Southeast Asia, Nepal, and India. The country wouldn’t be the same if drunk backpackers in elephant pants staggered by locals in traditional gho and kira. And that’s coming from someone who wobbled ‘round Asia in said pants years ago. Yes, I admit it. Bhutan makes great efforts to adhere to sustainable tourism standards, and we should laud their efforts, not resist them. Though their system isn’t perfect, the daily tourist fee is a tried and tested method of limiting tourist numbers, while simultaneously ensuring tourism’s revenues reach the entire population. If you’re still upset about the daily fee, remember that travel is a privilege, not a right. It’s well within the country’s rights to stem the flow of mass tourism using whatever means works best. Okay, okay, it’s time for me to get off my soapbox. Though sustainable tourism is imperative, Bhutan’s forward thinking policies aren’t the only reason it’s worth your money. You’ve stuck with me this far, so it’s about time I give you the answer you’ve been waiting for. Why is Bhutan worth your money? Because it’s freakin’ amazing, and there’s no other place in the world like it. You can while away afternoons in Bhutan listening to the patter of shoes slapping stone amongst the white walls of dzongs, fortresses. Sometimes it’s a red robed monk off to say prayers beneath towering statues of demons on the monastery side of the dzong. Other times it’s a woman in a silky kira dress making her way to work in the administrative side of the repurposed fortress. While driving through Bhutan, you can feast your eyes on the houses pretty enough to be mistaken for temples lining the country’s hills. Some are painted with intricate knots and auspicious animals, while others are painted with hairy, ejaculating phalluses. Yes, really. In Bhutan, you’ll never have to worry about sharing trekking trails. Far from the overcrowded routes of Nepal, even the most popular of Bhutan’s paths are delightfully quiet. The country’s 72% forest coverage means you’ll never go too long without a bit of greenery up above. 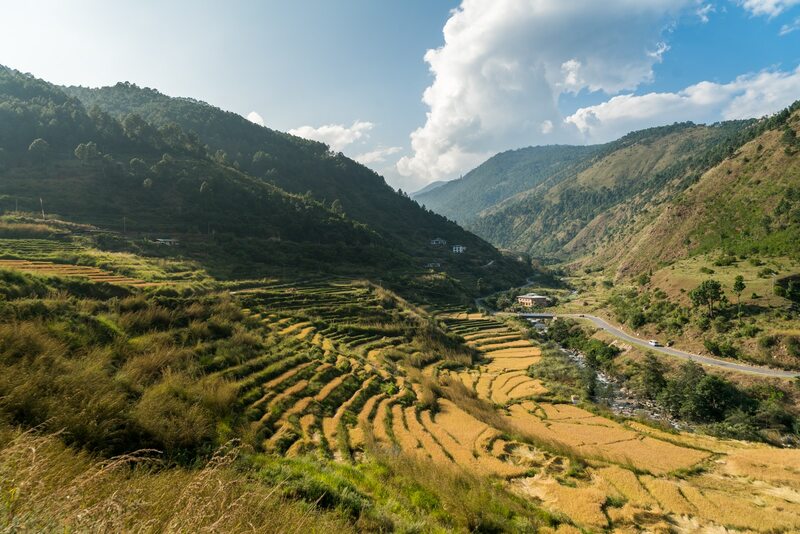 Even better, Bhutan’s nature is pristine and clean—something no other South Asian country can claim! Despite the Druk Path being Bhutan’s most popular trek, there was no one to compete with for views like these. The vast majority of Bhutan’s people are genuine and kind. They want to speak with you out of curiosity or interest, not because they’re scheming to sell you something. And meeting local people is all too easy when you have an affable local tour guide by your side for some of the day. Ultimately, I can only convince you so much. Wonderful as Bhutan may be, you either have the money to visit Bhutan, or you don’t. If you don’t have the money, don’t fret. Though they’re worlds apart from Bhutan, there are other mountainous countries in this world that are cheaper to visit. Nepal is the crowd favorite, though I’d personally recommend Pakistan. If, however, you do have the money, I can’t recommend Bhutan enough. It might be a big decision, but I assure you, you won’t regret it. Think of it this way: choosing where to travel is like buying groceries. You can buy cheap, imported apples at your nearest supermarket, or you can head to the farmer’s market for some locally grown, organic apples. The supermarket apples may be cheaper, but we all know the farmer’s market apples are the responsible—and tastier!—choice. Not everyone can afford to shop at a farmer’s market all the time, nor can everyone afford to travel to Bhutan over other destinations. But if you have the means and the motivation, I promise choosing Bhutan will be one of the most golden and delicious decisions you can make. Yay transparency! My trip to Bhutan was sponsored by Gray Langur Tours, but you can rest assured that I scrutinized the crap out of this topic just as I would if I paid my own way, and all these views are most definitely my own. Thank you for this! Bhutan is one of the places I am most interested in visiting, and I am still mad at myself for not making it happen while I lived in India. I personally love knowing that my tourist dollars will be helping with issues like education, healthcare, and infrastructure [it’s the social justice warrior in me], and I WILL make it there one day. So glad you had such a wonderful visit! If you still have your Indian passport, it’s not going anywhere 😉 Though fees for Indian tourists are being put into place, so it might not be as cheap for you as it once was. Hi Alex. I’ve been dreaming to go to Bhutan for years and last year I was so close to booking a trip with a local tour company. But I had to cancel that since I couldn’t find the right time to go there with my limited annual leave as well as limited flight schedule to Bhutan from Singapore — the nearest city from where I live which Druk Air serves. I’m curious about those photos with blue skies that you took, though. May I know in which month were those photos taken? Those monasteries look even more impressive with such blue backdrop! Blue skies make all the difference, I concur 🙂 I was in Bhutan throughout October and into the start of November. The weather was stunning and it was harvest season so the fields were golden for a time! I’ve been twice to Bhutan recently and I fully agree with what you wrote although, compared to other neighbouring countries, the geographical scenery might appear less appealing. Yes yes yes! I totally agree with their model of sustainable tourism and development. It might not be the cheapest place to spend a week or two, but it’s definitely worth it. Well written. pattering shoes for 250 a day? Hi Alex, I read your entire article. It is very nice experience shared. Can you please tell me, whether I am required to pay fees of $250 per day ? Bhutan wasn’t really on my radar, but your post really makes me want to visit! It doesn’t really seem that expensive, considering so much is included in the daily cost. I personally like that a portion goes back to the citizens too. Such a great post! Thanks for the helpful tips- I for sure want to visit before (if) it ever gets too touristy! I read your article and respect your viewpoint. Could not agree with many. I am a US Citizen and one afflicted by the travel bug. I will not be visiting Bhutan as a conscious and personal decision. – In Bhutan I met other tourists that, just like me, had saved for a good deal of time so as to be able to go there. The time these people had invested in saving and researching before actually being able to go resulted in their being far more respectful and knowledgeable than tourists in other countries, and let me only mention those neighbouring Bhutan. – It is worth noting that the country opened up to foreign travel in 1974, following an international scientific expedition at the end of which most participants advised the administration against opening up to mass tourism in order to protect the untamed nature and culture. Anyone that has been to neighbouring Nepal or India knows what flows of uncontrolled tourism can lead to. – This is a poor and difficult terrain country; both agriculture and production are severely limited by the natural conditions. So the fact that some of the money one pays goes to those Bhutanese needing support is welcome. While in the country, I could see many places where money was invested in actually improving things for the local population. This is why a country has an administration at the end of the day: to care for its people. And the pillars of the Bhutanese Gross Happiness Product clearly show where some of the tourism industry revenue goes. – It is true, the country is quite singular in the world from this point of view. This means nothing, because its conditions are also different from most other countries in the world. Having visited some 60 countries and working in tourism, I unfortunately saw the results of mass tourism in many parts of the world, including my home country. And then, just as Alex points out, travel is not a right. There are many other countries where one only needs a flight, bus, train or boat ticket and a valid passport or ID card in order to pass immigration. There is no need to travel somewhere if the visa granting procedure or one’s own principles are against it. The world would be a much better place if people went by the ‘live and let live’ principle. Great article. I am trekking in Nepal this March and may have the chance to spend 2 days in Bhutan. Do you think that is enough time to really experience things in Bhutan, and if so, could you recommend places to have in my itinerary? Definitely one for my bucket list next year. Love the ideology behind the sustainable tourism. Bravo to Bhutan for sticking to their principles with the ever increasing threat gobalisation poses to society. Been saying it for ages…but then again it’s important to allow everyone to make his or own experiences. It’s so nice to read about one’S own country and it’s more nice to know people having lots of good feels about Bhutan. Well I’m a young lady starting up a travel agnet in Bhutan and I would like to contact with any of you here who wishes to visit Bhutan. I will be so grateful to help any of you here.